It took a long time, but I am now completely convinced and become a fan of LUSH. I was well aware of the store, but I had no good overview on the products. Then a girlfriend introduced me by giving me 'Lemony Flutter', a cream for hands and body. A good products for dry areas. Normally I do not suffer from dry skin, but occasionally I have very dry fingers, especially when I worked with my hands a lot. Ordinary hand creams do moisturize, but let the dry spots as dry. This product really helps! And it smells deliciously fresh and lemony. I travel quite a lot and I try to keep my luggage as compact as possible. 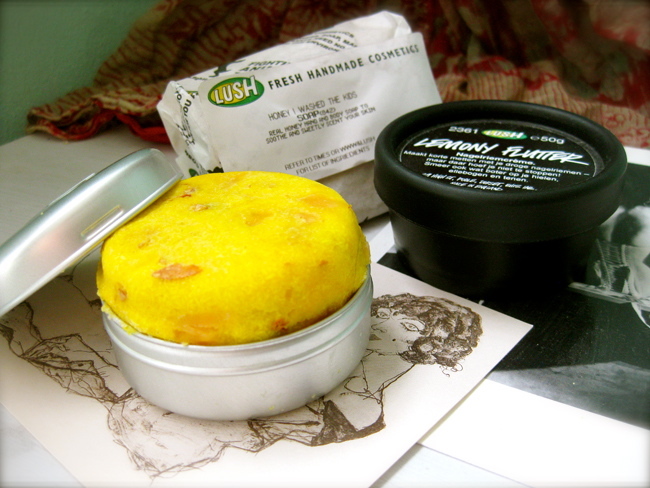 LUSH has brought me a new idea of compact: a solid shampoo and conditioner for the hair! I started with 'Godiva' because it is two-in one product. Now I only have a bar of soap for my hair care. The idea of not using the conditioner afterwards is odd, but this soap is great. It smells delicious. It's now in my bathroom and I enjoy the smell every time I'm there. Godive is wonderful to use. It became my ultimate travel item now already. When I was in the shop for my new super shampoo I decided to buy a gift. I often buy soap as a gift because most girls I know love it. Immediately I was attracted to 'Honey I washed the kids'. The scent is subtle sweet, like a honey cake. So lovely! I am definitey ging to try more products of LUSH. They are not just delicious, they are natural, environmentally friendly, not tested on animals and good for my grooming!